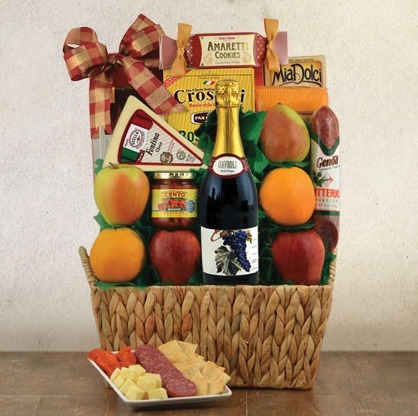 Fruit baskets, gourmet food, wines & champagne, gift towers and free shipping makes this company a great one stop shop. Capalbo’s Gift Baskets specialize in gourmet gifts, including Kosher certified gift baskets. With over 100 years of experience, Capalbo’s has constantly worked hard to adapt to the needs of their customers – whatever that may require. While they originally started out by selling fruits and vegetables door-to-door in Essex County, New Jersey today they are one of the largest gift basket retailers online – with one impressive inventory. A gourmet gift basket retailer with old-fashioned roots and modern inventory. There is an impressive inventory with Capalbo’s Gift Baskets, but their website has issues making it hard to find everything. You cannot right click on things to open in new tabs or windows and sorting their inventory can be overwheliming. That aside, they have a variety of fruit baskets, including fruits mixed with other items, wine and champagne baskets, sweets and savory-themed baskets, cheese, crackers, Italian products, bakery items, beer, spirits and Kosher products. There is no customization with Capalbo’s Gift Baskets. You cannot add on to a basket in any way, they do not have any design-your-own options nor can you swap out items you do not want. That being said, they have such an extensive selection the limited customizable options may not be an issue. Literally, their inventory will take you a long time to sort through due to so many options – you wouldn’t even dream of customizing. While they do have tons to choose from, their baskets don’t apply to all sentiments. 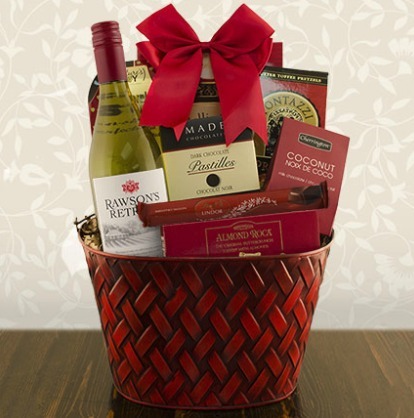 They do have the usual holiday-themed baskets, which you would expect from any company offering gift baskets. When it comes to sentiments, they have thank you, birthday, anniversary, sympathy, etc. They also have their gifts categorized by Gifts for Him and Gifts for Her. While they don’t offer vegan or gluten-free baskets, they do have Kosher and sugar-free. We were especially excited about the sugar free option – since very few merchants offer that and more should – sometimes a basket just doesn’t need sugar! The corporate gifts option through Capalbo’s Gift Baskets is quite impressive. They have corporate ordering experts that work closely with companies to customize their gifts. Multiple orders can be placed on an Excel spreadsheet and directly emailed to the corporate sales line. They also offer discounts for those that ship before Christmas and those that order during holiday peak times. Discounts range from 10 to 15 percent depending on the order total. They also allow custom gift baskets for corporate buyers – including colors, branding and personalization option. Items that have been personalized, however, cannot be returned. So corporate buyers must be cautious about what they are ordering. Prices were much harder to gauge with Capalbo’s than they should have been – primarily because you cannot search by price unless you are within a specific category. That being said, they do have some baskets under $50, but the majority of the gift-worthy ones are in the $100 range. Compared to others, their pricing is not outrageous – in fact, it’s relatively average. A large majority of the baskets from Capalbo’s are shipped for free, which we definitely like. It is refreshing, considering plenty of merchants out there charge almost as much as the basket in shipping. That being said, free shipping doesn’t apply for local deliveries, same-day shipping, etc. They do ship out the same day and local delivery is available same day for recipients in certain areas of New Jersey. Those that don’t have free shipping will have rates that vary – and express shipping can dramatically increase with the larger baskets. Certain states cannot except beer, spirits or wine baskets from Capalbo’s Gift Baskets due to regulations – but this is a standard practice among any company shipping wine and spirits. Capalbo’s takes great pride in packaging their gift baskets. The baskets are shown as-is on the site so that you can clearly see what you are buying as well. They don’t give respective sizes of the products in the baskets – which can be deceiving. Also, they don’t tell you how much the total basket weight is or size – so again, you may end up with a much smaller basket than you originally thought you were ordering. All of their wines, however, are full-size bottles. You can add some special ribbon and a gift message as well with your basket. Capalbo’s Gift Baskets do offer a satisfaction guarantee. If the product arrives damaged or your recipient is unsatisfied with that they have received, they can file their return request within 21 days of receipt. Item must be in its original packaging for a full refund and items that were opened will need to be filed with customer service. If shipping was paid for, they will credit the amount of the product less shipping – which means you could still pay for shipping on something you weren’t even satisfied with. Capalbo’s always tries to go the extra mile, but their customer service is lacking and limited. They are only available via phone 8am to 6pm and email. There is no live chat and their FAQs section is rather disjointed – making it hard to find what you are looking for. Capalbo’s Gift Baskets is not BBB accredited, which is strange for a company that has been around so long. They do, however, have an A+ rating. Free shipping on a large majority of their baskets. Under $50 – Baskets under $50 contain smaller sized cheeses, a few fruits and littler packages of treats. There are a few that have wine. $50 to $100 – Most of their baskets are within this price range and include wines, cheeses (such as Brie), chocolates, cookies, crackers, accompaniments, fruit-filled cookies and cakes, etc. You can find baskets with beer, liquor, wine and spirits in this price range too. $100 to $200 – Baskets with a larger selection and champagnes are found in this price range. But, those with champagne even in this price are small – such as one bottle plus two more items. $200 and up – Baskets in this price range contain bottles of wine (up to five per basket), cheeses, multiple snacks, pates, smoke meats, crackers and cheese, sweets, etc. Customers looking for something a little more unique will enjoy shopping with Capalbo’s, but this is definitely a site for the more patient shopper. Those in a hurry will likely get frustrated at how overwhelming the site is and its limited user-friendliness. We appreciate the variety Capalbo’s Gift Baskets has. It is obvious that they want to appeal to all customers, which is why their catalog is packed full of options. They also have a lot of baskets that qualify for free ground shipping and we like that they have a good volume of baskets still for under $50 – though their size is up for debate. We wish they would fix their site so it is easier to navigate and sort through products. After an hour of browsing the site, we still found options we didn’t even knew existed – and a better layout and functionality would fix these baskets that slip through the cracks. Adding some size information about the products in each basket would also be nice – and make it easier to determine if a particular basket is worth the price. Gourmet gift baskets with free shipping. Under $50 - Baskets under $50 contain smaller sized cheeses, a few fruits and littler packages of treats. There are a few that have wine. $50 to $100 - Most of their baskets are within this price range and include wines, cheeses (such as Brie), chocolates, cookies, crackers, accompaniments, fruit-filled cookies and cakes, etc. You can find baskets with beer, liquor, wine and spirits in this price range too. $100 to $200 - Baskets with a larger selection and champagnes are found in this price range. But, those with champagne even in this price are small - such as one bottle plus two more items. $200 and up - Baskets in this price range contain bottles of wine (up to five per basket), cheeses, multiple snacks, pates, smoke meats, crackers and cheese, sweets, etc.